Feelings are part of life - feelings are life. If you take away what people feel, you take away anything meaningful. Wanting to diminish the evil in this world is a good cause, one I have fought for the majority of my life, but not like this . . .
And then Chase arrives in town and threatens to undo all the good Cherry has done. Because it turns out she's not the only one who can see what she sees . . . I have been a Carrie Fletcher fan for quite some time now and I couldn't believe I hadn't read any of her books. I own All I Know Now and have glanced through it, but when she announced her newest read (When The Curtain Falls) I decided I needed to up my game and read the others before it was released. This was a deliciously sweet magical read that really surprised me. I don't always like books with a hint of magic in them, as it's not my type but this one just worked. Cherry has a talent, a talent others don't know she has, the ability to see others feelings. Blessed with a skill of being able to bake (inherited from her father) she uses this to help others without them ever knowing it is what the needed. When she moves to her newest venture and meets someone else, someone slightly similar to her - chaos is caused - and then she learns there is more to her skill than she ever knew. 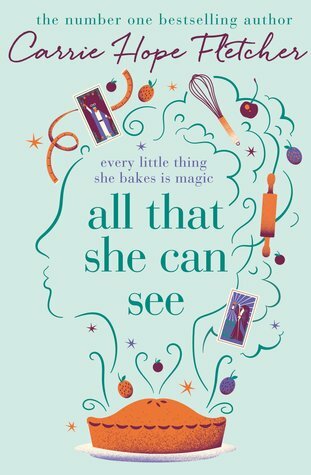 All That She Can See was a lovely Disney esque read with a quirky take on feelings. Cherry was a warm wonderful character that I instantly took too, I felt all her emotions and that for is what made it so easy to read - I felt for her, in more ways than one. Chase had my back up straight away (a bit like how Cherry felt) but I think that's why the pair worked well together, opposites attract and all that. The cast of supporting characters was a mixed bunch, and all written differently to support and contrast each other. This read overall surprised me. I knew I would enjoyi it as I really enjoy Carrie - her storytelling in real life so to have it written down and her own ideas on to paper, like I mention magical elements don't always work for me (despite being the biggest HP fan) I just tend to steer clear but I would read this over and over again. Carrie Hope Fletcher is an actress, a singer-songwriter and an author. She also plays the ukulele, guitar and saxophone. 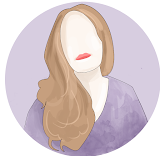 Carrie is well known on YouTube for her channel 'ItsWayPastMyBedtime' where she has over 600,000 subscribers. Most of her videos consist of giving advice to her younger audience, talking about Disney and covering her favourite songs. She played Eponine in the West End production of Les Miserables at the Queen's Theatre until February 13th 2016. She is the first actress to have played both young Eponine and older Eponine. She went on to play Truly Scrumptious in the UK touring production of Chitty Chitty Bang Bang, and Wednesday Addams in the UK touring production of The Addams Family. Her debut book, 'All I Know Now: Wonderings and Reflections on Growing Up Gracefully' was published in May 2015. The book is based on what she writes on her blog.